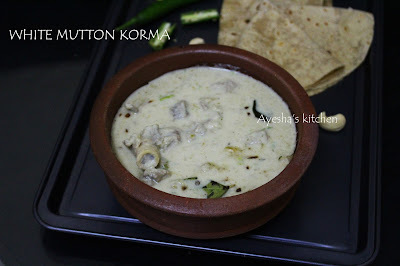 Mutton korma / Mutton white korma is a delicious flavorful Malabar dish which is rich and creamy. The texture of this curry itself makes us feel hungry. Korma refers to mildly spiced Indian curry of meat or fish with yogurt or coconut gravy. Kuruma / Qorma itself is of various varieties like spicy korma, Red korma, white korma and so on. White korma is my all time favorite. 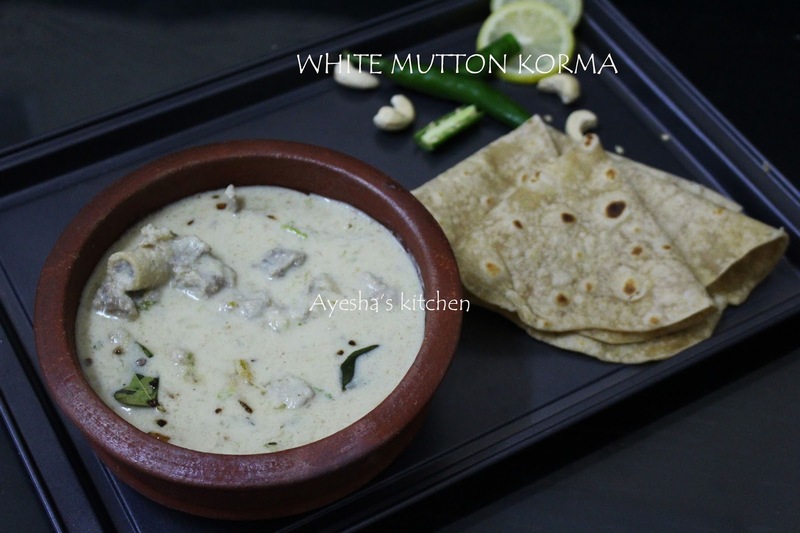 Speaking about white korma, its the traditional classic dish of Malabar, region in Kerala. Chicken white korma, veg korma, Mutton white korma, Ayala korma (fish korma) are some of the most popular gravies common in malabar during marriage functions, eid, ifthar or any special occasions. The name itself says,,,its a white colored curry with no spice powders other than the raw garam masala. But we will be surprised with the taste and flavor of this curry. It is thick , rich and ease in preparation with very few ingredients. So here is the classic party dish with mutton which is very tasty and satisfying main course meal served along with malabar rice pathiri , Paratha, Chapati, naan etc..
Heat oil in a pressure cooker. Add cardamom, cloves ,bay leaves . Saute for a while and then saute the sliced onion for 2 minutes. Then add ginger garlic paste and chilies. Saute for a minute. Add the cleaned mutton pieces along with coriander powder, salt. Close the lid of the pressure cooker and cook for 2 whistles or until the mutton is cooked. Now open the lid by releasing the pressure inside and let it boil for few minutes stirring occasionally. Add the chicken cube (optional) and vinegar at this stage. Grind together grated coconut, cashew nut along with a cup of water to a fine paste. Pour this coconut mixture over the mutton gravy and cook on medium flame until the mutton is well coated with the coconut gravy. Now the consistency will be very thick. So add a cup of hot water. Do not add more water, it will make the curry worse. Kuruma must be very thick and creamy . Stir well and off the flame. Heat a pan with 2 tsp of oil and fry the chopped shallots and curry leaves. Pour over the curry for seasoning. Garnish with chopped coriander leaves. 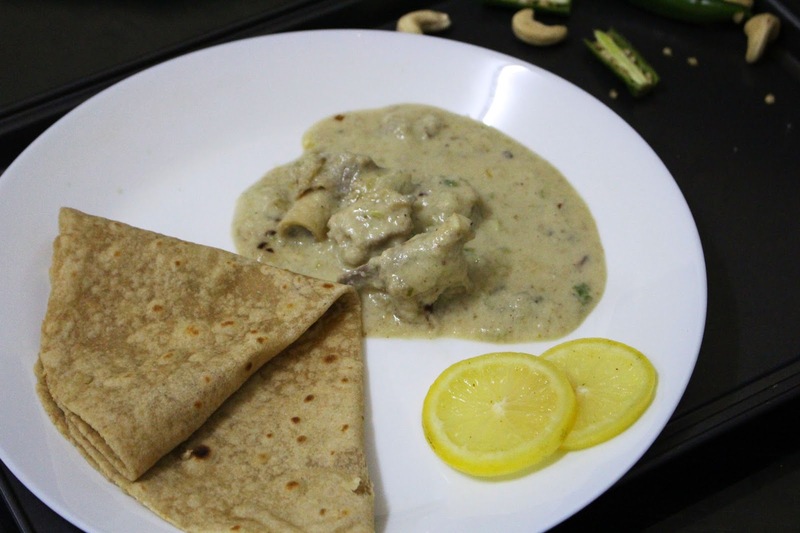 Delicious White mutton korma is ready to serve.